Twenty-two years ago, Ken Imhoff started building a Lamborghini Countach, by hand, in his basement. Seventeen years later he was done, and the world watched as he smashed a hole in his house to get it out. As Jalopnik has exclusively learned, Imhoff is now planning to sell it. But why? "Daddy's down in the basement," Ken Imhoff's daughter — first in diapers, later as an elementary-then-middle-schooler — would tell relatives who wondered why the family patriarch was always missing from the dinner table. Ken was in the basement designing and machining and welding and measuring and sanding and painting. He was trying and failing and trying again. He was building, from scratch, an Italian sports car from the 1980s, fabricating the tubular space-frame chassis, constructing the wooden bucks from which he formed the body, and building the engine – a Ford 351 Cleveland V8 with gleaming chrome velocity stacks, (in case you were wondering if it had the correct V12). With necessary breaks for work and sleep, and accounting for occasional lapses in productivity, Ken was down in that basement for 17 years. Some years he would feel overwhelmed and lose interest, then — wracked with guilt every time he passed the basement door — he'd figure out a way to start up again. Sometimes he'd dive right back in where he left off, other times he'd find a new facet to work on to get his mind off a problem he couldn't solve. He had to get the car exactly how he wanted it — and he wanted it perfect. Ken estimated it would take him five years, and wound up off by 11 years. Twelve if you include getting the car out of the basement. Still, he did meet his most recent goal – the last of many micro-goals that helped him get the project finished — of rolling it out in time for his 50th birthday. 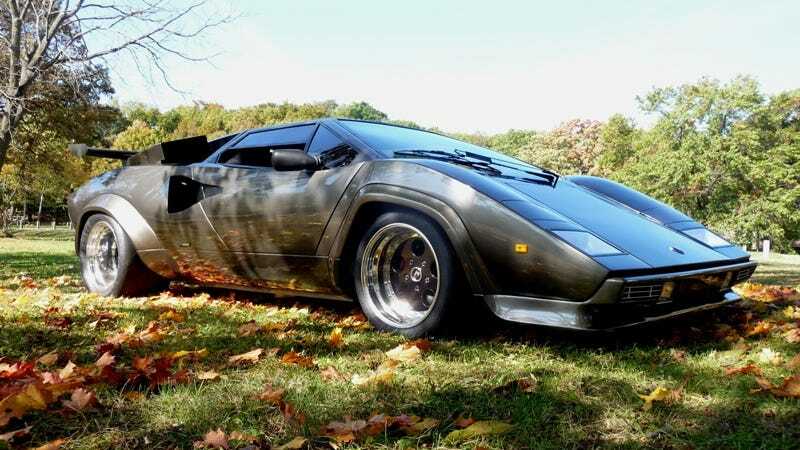 The story of Ken Imhoff's hand-built Lamborhini Countach replica has transcended Internet lore. Mention "the guy who built a Lamborghini in his basement and had to knock the wall down to get it out" at a bar in Cleveland or a pub in Newcastle and it's a sure bet at least someone there will know what you're talking about. Ken's supercar opus started as a deep personal connection with the Lamborghini Countach. Ken says it was sparked by the Hal-Needham-fever-dream opener of the movie Cannonball Run. You know the scene: A piano-black Lambo on a desert highway skids to a stop by a 55-mph road sign; the door scissors upward; we see stiletto heels; a statuesque blonde passenger in a skin-tight body suit bounds out; she's shaking a can of Krylon; she runs to the sign, sprays a red X over the 55, flashes a 1000-watt grin, jumps back in the car and it takes off – pursued in vain by the highway patrol. He had to have one. But, c'mon. A Lamborghini Countach? Yeah right. Whenever he thought about how he might someday get that car – an insurmountable goal for a middle-class kid from Wisconsin – he heard his dad's voice, saying, "Why don't you just build it yourself?" "My dad instilled in me from when I was very young, Ken says, 'If you can make it, don't buy it.' My idea was to buy a kit car, with the idea of getting something on the road pretty quick, not to spend a lot of time on it. I couldn't afford it. It was my dad who convinced me I could just build it. Make it small projects over time, and it would accumulate into a finished project." Five years, tops, he thought. Since Ken's story went public, back in 2008, car freaks have held him in the kind of regard normal people reserve for Seal Team Six. He became the car hobbyist's übermensch, a regular guy who, through superhuman focus and insane determination, led him to a remarkable automotive achievement. Ken had been working in machine shops since he was 16 years old, and although his day job was as a process engineer, he'd always messed with cars. In that way, he was like us. If he could build a Lamborghini in his spare time, we'd think, the least we could do is just shut the hell up and finish the BMW 2002 or '66 Mustang languishing in our garage. Two weeks after Ken and his wife Eileen's honeymoon, Ken started work on the car we now know as the Basement Lambo. He'd only known Eileen for two months before he asked her to loan him $2,000 to buy a ZF transaxle from a DeTomaso Pantera. (She agreed, as long as he didn't tell her parents. He paid her back.) In the early days of the build, she would sit in a barca lounger reading a book, with their dog at her feet, while he worked. Eventually the dog retreated upstairs, and she followed. Eileen recalls being pregnant with their first child, now a teenager, when Ken fired up the engine for the very first time. So why on earth would he ever he want to sell it? "I saw that it was starting to show little signs of corrosion here and there, and it started gnawing at me that I'm not taking care of this thing the way I should. I'm doing it a disservice. And I thought, ‘boy, could I actually sell it? Could I actually pass it on to somebody else and be okay with that?' I was a little concerned that I could actually let go of it. I worked on this thing for 17 years. "I get that same reaction from when I tell people I may want to sell it, and they say ‘How could you sell that?' Most people don't understand, and I have to go into a lengthy conversation about how it's a journey and now we're at the destination, and now I want to do something else. And it's another project. That's what I need to do." He gestures to the shell of a Studebaker Hawk that now shares garage space with the Lambo. - MSD box and billet dist. - Brakes Wilwood Suprelite 4 piston calipers and 12"x1.25" rotors. - Exhaust handmade 180deg. 2" S.S. headers, 3.5" collectors, 12" long x 3.5" racing muffers. - Wilwood racing pedals/master cylinders/hyd. clutch. - Performance untested weight 2700lbs.